Want to save energy by cutting your cooking time and get better results this Thanksgiving? Then try spatchcocking your turkey! Spatchcocking means removing the backbone and cutting and removing the breastbone so you can open your fowl and cook it flat. Not only will it cook faster (about 75-90 minutes for a 12-pound bird), it will cook more evenly, with moister breast meat and crispier skin. It’s also easier to carve. 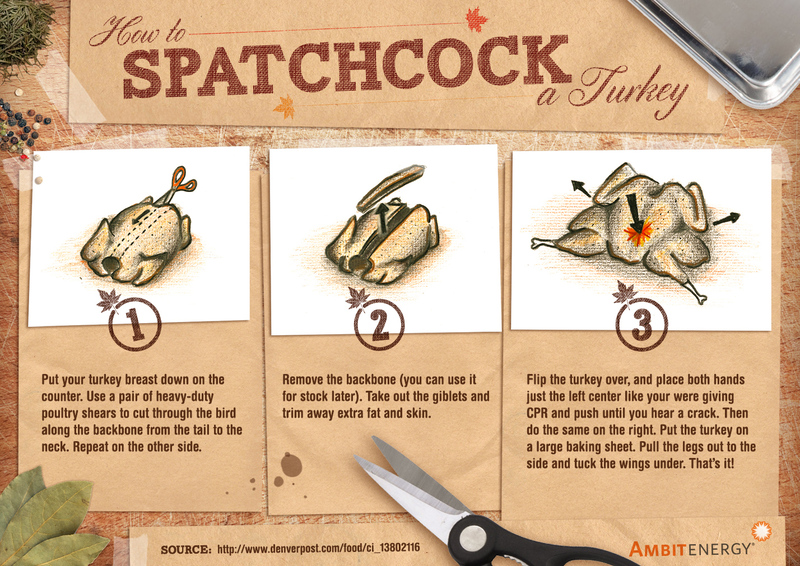 The simplest way to spatchcock a turkey is to ask your butcher to do it for you. But if you’re a more hands-on chef, it’s a fairly straightforward procedure. Put your turkey breast-down on the counter. Use a pair of heavy-duty poultry shears to cut through the bird along the backbone from the tail to the neck. Repeat on the other side. Remove the backbone (you can use it for stock later). Take out the giblets and trim away extra fat and skin. If you’re good with a knife, cut out the sternum. Or you can just flip the turkey over, and place both hands just the left center like your were giving CPR and push until you hear a crack. Then do the same on the right. Put the turkey on a large baking sheet. Pull the legs out to the side and tuck the wings under. That’s it. You’ll also find that your seasonings penetrate more evenly and deeply. With all the hustle and bustle of the holidays, saving time and energy preparing your turkey really is something to be thankful for.